This article is about the normal showdown version. For the Xeno Clash version, see Xeno Sagittarius Clash. Sagittarius Showdown is one of the Normal Showdowns. 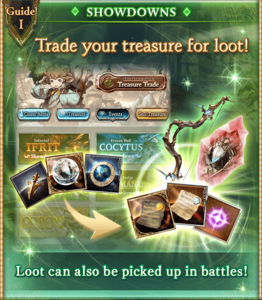 It awards items to trade for the Sagittarius summon. 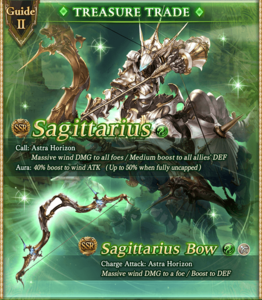 Sagittarius Showdown can be farmed on Hard or Very Hard fairly easily for newer players, allowing them to easily accumulate event items. However, since Anat requires 0 AP to obtain and is a vastly superior summon, and since none of the event weapons are worth using, the only items worth buying are the 5 Half Elixirs per month, one per day, and whatever other random purchases you might want. High innate double attack rate. 3-hit Wind damage to random allies. on all allies for 2 turns.
. Reduces charge bar of all allies by 20%. Medium Wind damage to all allies and reduces charge bar by 80%. Sagittarius does a lot of damage, but does not multiattack. He gains a LOT of defense from Troposphere, and Astra Horizon deals huge damage and also neuters your charge bars, so you really just want him to not use his Charge Attack at all. Bring a fire Dark Fencer with Rain of Arrows III to gain the time necessary. Pace the first 50% well, so that you push him below 50% on the same turn that he would fill up all his charge diamonds. This means sandbagging Gravity to help waste his 50% trigger. Between Gravity and Stall, you should have 2 turns to either Break him or push him below 25% to waste that trigger as well. Finish Breaking him as necessary, then take it home. The event shop sells the Sagittarius summon and Wind weapons. Items may restock with higher costs when sold out. This page was last modified on 11 March 2019, at 14:57.